A little over a month ago, Sean Couturier finished his fourth NHL season. Despite setting a career high in goals and only being 22 years old, many fans are left continuing to question his offensive abilities. To be sure, the Philadelphia Flyers did not pick Couturier 8th overall in 2011 only to have him to be a “shutdown specialist,” although he excels at containing the top players of the opponent. The team expects, and has expected, that Couturier bring a fair amount of offense to the table to go along with his shutdown abilities. With capable young centers in the Flyers system, many are questioning why he seems to be the front-runner as the teams’ second-line center moving forward. Why not give Brayden Schenn another shot? What about Laughton, Cousins, or Lecavalier? The short answer is this: Not only is Sean Couturier the Flyers best in-house option for a second line center, but he produces at a level comparable to top-six forwards league wide. And, on top of this, the scary thing about Couturier is the fact that he is still only 22 years old and has not yet been used properly. This evaluation of Couturier will look at three things. First, his usage. As will be demonstrated, there was virtually no legitimate NHL forward who was used like Couturier this season. Second, his comparison to Flyers forwards will be examined to see if his offense can be considered “top-six”. Finally, it is wise to see where Couturier stacks up league wide. Would he be a second-line center on any other NHL team? To say that Sean Couturier was given tough assignments this season is an understatement. Not only was Couturier given some of the worst zone starts in the NHL, but his line-mates were sup-par. Among NHL forwards who played at least 1000 even strength minutes this season, Couturier had the second worst zone start percentage int he NHL. He started 281 shifts in the offensive zone and 426 shifts in the defensive zone, ending up with a 39.75% zone start percentage [281/(281+426)]. Only Deryk Engelland had a worse percentage than Couturier. It is possible to find other players who were given a worse zone start percentages than Couturier, but the purpose of putting a ‘1000 even strength minutes’ qualifier in place is to narrow the field down to those players who were actually relied upon for their team. 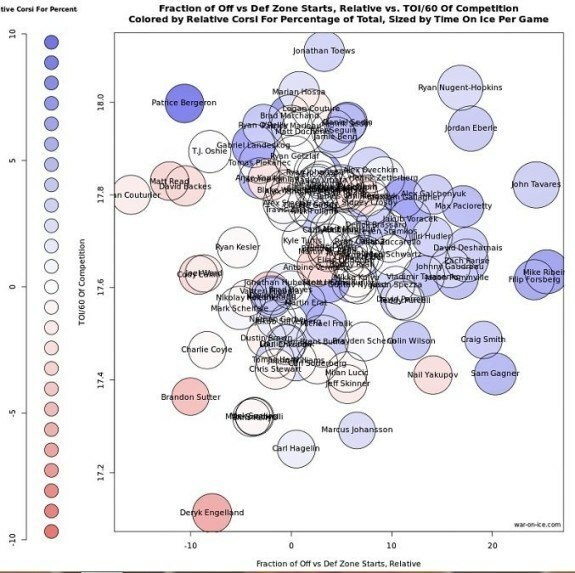 So, if a player averaged five minutes per night and started every shift in the defensive zone, nobody would care if that player did not produce offensively. He is being given fourth line minutes. The fact is, players who play at least 1000 even strength minutes are expected to produce. If we considers how a player started his shifts relative to the rest of the team, then we find that there was not a forward in the NHL who logged at least 1000 even strength minutes who started a larger proportion of his shifts in the defensive zone relative to his teammates than Sean Couturier. This is visually displayed in the chart below from war-on-ice.com. It is also important to note that Sean Couturier’s line-mates for much of this season left much to be desired. Yes, Matt Read is a quality, two-way forward who can typically be counted on for 20 goals. However, in mid-January Read announced that he had been playing much of the season with an ankle sprain, which explains his downturn in production for the first half of the season. Another frequent line-mate of Couturier’s was RJ Umberger. Umberger has been a possession anchor for years and his return to Philadelphia was a disappointment. Couturier’s most productive stretches of the season came when he was playing with one of Brayden Schenn, Wayne Simmonds, or Jakub Voracek. However, he was rarely given a long look with any of those players. In almost every relevant statistical category Couturier ranks in the top six Flyers forwards. Below is a list of some of Couturier’s statistics with his ranking among Flyers forwards in parentheses. All stats are measured at even strength and a qualifier of 750 even strength minutes was in place for the data collection. In no category did Couturier fall out of the top six. Keeping in mind that Couturier started more shifts in the defensive zone than any other forward on the team makes these numbers even more impressive. Just imagine what Couturier could do with even slightly better zone starts. To argue that Couturier should not be a top-six forward among the Flyers current group is ludicrous. Special teams are a different story, but Couturier has shown that even with terrible usage, he can still keep up with the other Flyers forwards. Continuing this look at Sean Couturier’s top-six credentials, it is important to look at how Couturier stacks up league-wide. I can hear the argument now: “Just because Couturier is top-six on the Flyers does not make him good! Put him on a contender and he’s a 4th liner!” So, let’s take a look. This past season Couturier was tied for 141st (among forwards who played at least 500 even strength minutes) in the NHL with 25 even strength points . Considering that there are 30 teams in the NHL, it would make sense that there are roughly 180 “top-six forwards.” So Couturier clearly fits within the top-six range. His even strength point total is the same as bona-fide top-six forwards like Gustav Nyqvist and Ryan Kesler and he scored more points at even strength than players like Wayne Simmonds, Chris Kunitz, and Antoine Vermette. In conclusion, even at the ripe young age of 22, Sean Couturier stacks up favorably as a top-six center at even strength, based upon his even strength production alone. When his usage is taken into consideration, it is clear that he is a special player. Rather than questioning his abilities, Flyers fans should be excited about the future. Tomorrow I will take a look at why Couturier should NOT be considered next to a couple of the players to whom he is so frequently compared. Then, on Thursday I will examine a few steps that Couturier, the Flyers coaching staff, and Flyers management can do to help him become a top-notch, two-way threat. To be taken directly to Part Two, click here.